Whether you love the Valentine's Day holiday or you wished everyone kept the cards to themselves, it's a great opportunity to spread some love to those you really care about. Here are 14 ideas to keep your personality as a runner throughout this holiday and celebrate what you love with those you love! 1. Take your kids out for a run. Show them what draws you out to the roads. It doesn't have to be a long run. Just go to one of your favorite running spots and enjoy spending time and fresh air with them. 2. Bake a carb-loaded pancake breakfast with fresh strawberries and cool-whip. It's a sure -fire way to make sure you go on a run that day! 3. Donate your old running shoes to a charity. 4. If you are used to running on the pavement, take a friend or significant other to the trails. You may not want to run as far as usual as trails are harder to run and therefore take more time. 5. Bake some heart shaped energy or protein bars. If you are part of a running group make up a batch of bars the night before for a thoughtful gift. 6. Watch an inspiring running movie like Chariots of Fire or Spirit of the Marathon. 7. Make a card in the shape of a shoe and give to your main running squeeze thanking them for all the miles they have helped you through. 8. Design your own coupons for a free post-workout massage courtesy of yours truly. 9. Create a personalized running playlist complete with their favorite songs and some surprises! 10. Frame a picture of a running moment that touched them or that you shared together. 11. Sign up for an early morning 5K and then head to your favorite breakfast spot. Or make it an evening race topped off with a drink. 12. Make some strawberries dipped in 70% dark chocolate for a healthy, sweet dessert. 14. Give the gift of training with your partner with 6 Weeks to the Half Marathon which is 50% off until Saturday at midnight! The best gifts are really those where you create memories and bonds and what better way than to do so through running? This is a truly inspiring story of a marine who will be pushed acrossed the Phoenix Marathon finish line. He was injured after a tour in Iraq and a couple days before his baby daughter was born. Here is someone who wants to be there for his child! Do you have chronic iliotibial band syndrome? Here are some tips for dealing with it. Have you heard of the Philly 0.0 race? You take one step across the start/finish line and then are at the after "race" party complete with t-shirt, drinks and music. You can read the details here ! "Why didn’t you beat your time from last year?" "I get tired driving that far." "Running will ruin your knees!" "I did a marathon once-it was one of those 5k ones!" 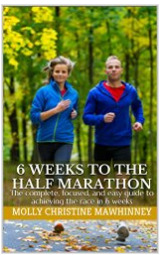 "6 Weeks to the Half Marathon" is 50% OFF for Valentine's Day! Training for a half marathon not only gets you healthy and keeps you challenged but it is also a great relationship booster to do with your significant other. That's why "6 Weeks to the Half Marathon" training program is 50% off until Saturday at midnight! 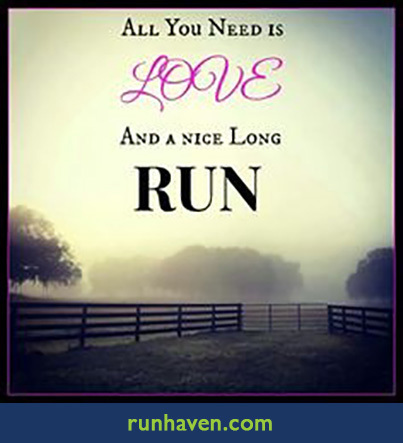 As the picture says...all you need is love and running! Take a look at the Table of Contents with additional notes on what's presented in each chapter of the eBook here.